*UPDATE* Billboard Ad For Facebook Fan Page - We Now Have An Image! *UPDATE* Billboard Ad For Facebook Fan Page – We Now Have An Image! As you may remember, we posted an article less than a week ago about The Forest County Chamber of Commerce in Wisconsin running a billboard add for their Facebook Fan Page. At the time of the article, we didn’t have an image of the billboard itself, nor did we know how the billboard was performing for the county. But thanks to Jaunted.com, we now have an image of the billboard and some more details into this exciting story about running a billboard ad for a Facebook Fan Page. After tracking down the “Facebook Fan Page” on Facebook, I discovered that this is NOT actually a Page, but a Profile. 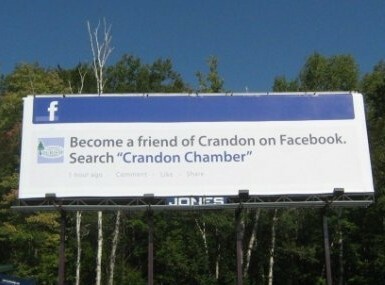 Here’s Crandon County Chamber of Commerce Facebook Profile – so go ahead and befriend them if you’d like – but you certainly will not be able to “fan” them as you would on a Facebook Fan Page.